It’s day 9 of our read-along which means we only have four left including today’s! In case you’ve somehow missed it on our blog and twitter (where have you been?) 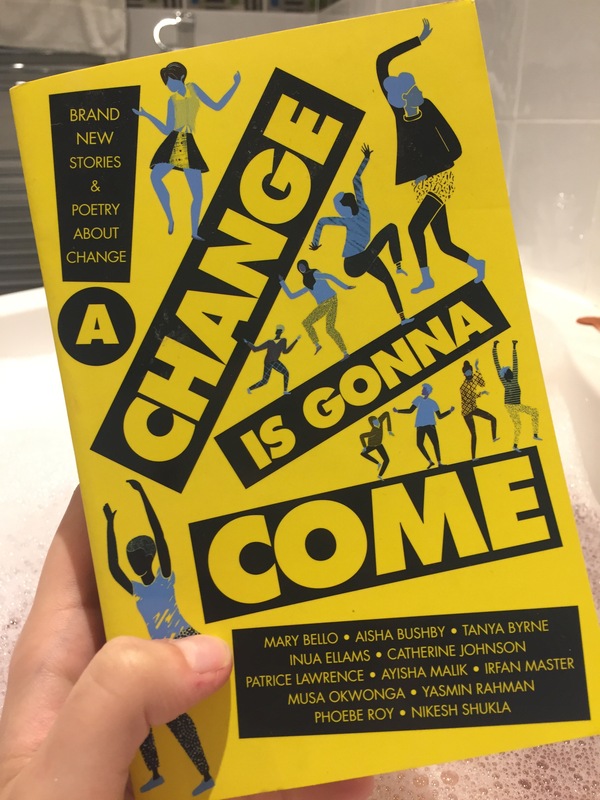 we are doing a read-along blog tour of the BAME anthology, A Change is Gonna Come. Im absolutely loving the book so far – I’ve found something in each and every story or poem that I love, and that’s such a wonderful feeling. My favourites so far are Hackney Moon by Tanya Byrne and We Who? by Nikesh Shukla. I also adored the first chapter, The Elders on the Wall by Musa Okwonga so much and it’s stuck with me a lot (I’ve now read this four times because of how powerful it is!). These have affected me a lot and I’ve been thinking about them ever since I read them. I loved Hackney Moon because of the great representation shown of queer girls (I don’t want to assume labels of the characters as they are not used explicitly). Queer women and their relationships are rarely represented and it’s even rarer for those queer characters to be women of colour so Hackney Moon was so wonderful to read! I also adored the story itself and the way it was narrated was so beautiful and reminded me of The Book Thief by Markus Zusak as it seems to be narrated by fate or the universe. I really really want to read more of Tanya Byrne’s work! We Who? was beautifully written and it felt so realistic in terms of both the dialogue and the way the protagonist’s thoughts were written. I almost cried towards the end (I held it back!) because of how sad it became. The story revolves around two friends during the Brexit campaign in Britain and how it affected their friendship due to racism. I was so heartbroken for the conflict of the protagonist! Please read this story! It has such a powerful message. I hope everyone has enjoyed today’s story which is A Refuge by Ayisha Malik! I just finished it and it is yet again another emotional and important story. I truly love how great all the chapters have been so far and how inspiring the stories are. Let us know how’s you’re getting along with the read-along at our twitter or in the comments!